The risk of major ulcer complications on treatment with non-steroidal anti-inflammatory drugs (NSAIDs) is known to increase exponentially with age. However, in a pooled analysis of 12 trial arms, the incidence of endoscopic ulcers on treatment with NSAID was found to increase with age in a roughly linear fashion. Thus, it is concluded that increasing age is associated with both more frequent and more serious NSAID gastropathy. Use of non-specific non-steroidal anti-inflammatory drugs (NSAIDs) is associated with the development of upper gastrointestinal ulcers and ulcer complications: bleeding, perforation and obstruction. It is very well accepted that the incidence of these complications increases exponentially with increasing age.1–5 However, little has been published about the relationship between the incidence of endoscopic gastroduodenal ulcers and age. Knowing this relationship might help us to better understand whether the age-related increase in ulcer complications is driven solely by an increase in the incidence of ulceration in itself, or whether age increases the propensity of a given ulcer to bleed or perforate. We evaluated the pooled results of 12 blinded randomised clinical trials with scheduled endoscopies that compared the cyclo-oxygenase-2-specific inhibitors celecoxib and valdecoxib with non-specific NSAIDs and placebo in healthy volunteers or patients with osteoarthritis or rheumatoid arthritis. All trial patients were examined endoscopically at baseline and after treatment. Only patients free of ulcer at baseline could enter the trials. We pooled the results from endoscopies after treatment, looking at the rate of endoscopic gastric or duodenal ulcers (⩾3 mm in diameter with depth). We used the data from the comparator (non-coxib) groups comprising patients taking non-specific NSAIDs (total n = 2226; naproxen approximately 50% and ibuprofen and diclofenac 25% each) or placebo (n = 1346). Duration of treatment ranged from 1 week (healthy volunteers, about 20% of participants) to 12–26 weeks (osteoarthritis (majority) and rheumatoid arthritis). We evaluated the number and percentage of patients with ulcers grouped by age (table 1). A Cochran–Armitage model for trend tested the association between age category and ulcer rates. The mean age of the subjects was 56 (18–89, SD 14) years. Most (66%) were female. The incidence of endoscopic ulcers during NSAID treatment varied from 9% to 12% in subjects aged ⩽55 years and from 18% to 23% in the elder groups. The overall incidence of endoscopic ulcers was higher in subjects treated with NSAIDs compared with those treated with placebo (odds ratio 7.4; 95% CI 5.2 to 10.5), and higher in each age group. The percentage of subjects with endoscopic ulcers increased significantly with age in both groups (NSAIDs, p<0.001; placebo group, p = 0.001; table 1). With the exception of the youngest age group, the increase in ulcer incidence was roughly linear, and certainly not exponential (fig 1). 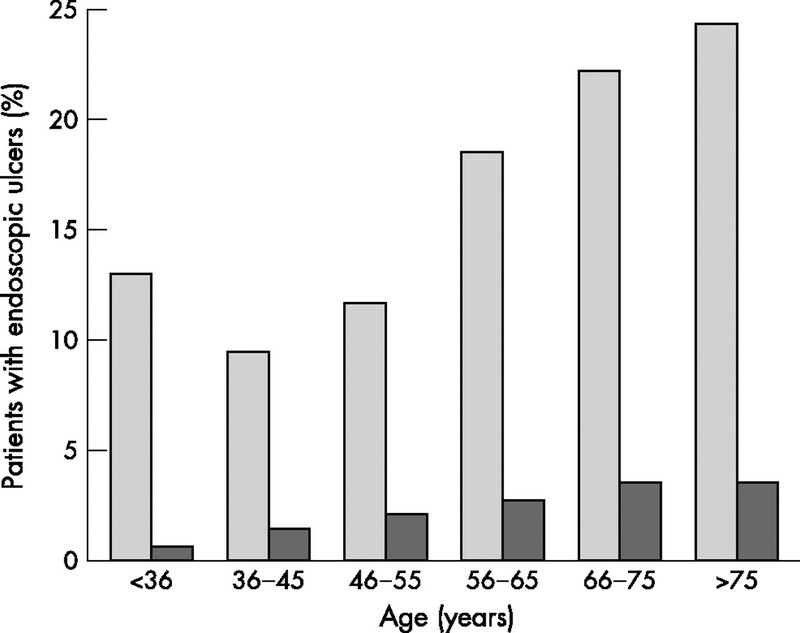 Incidence of endoscopic ulcers by age group. Light bars, pooled non-steroidal anti-inflammatory drug groups; dark bars, pooled placebo groups. The risk of endoscopic ulcers on non-specific NSAID treatment is considerable at any age. The rate increases with age both in patients treated with NSAIDs and in those treated with placebo, but less sharply than the increase reported for ulcer complications. As such, the increased risk of complications in the elderly can only partially be explained by an increasing risk/rate of ulceration. The method of pooling in our study is somewhat crude as we combined all subjects into large cohorts according to (NSAID or placebo) exposure. We felt this was acceptable as our main interest was not a pooled estimate of the treatment comparison, but of age-related ulcer risk in the NSAID group. Pooling short-term and long-term studies is potentially a larger problem, as the 1-week studies are mostly on young volunteers, and the 12-week and 26-week studies on patients with osteoarthritis/ rheumatoid arthritis. However, it turned out that the ulcer rates were comparable in the short-term and long-term studies. The relatively high ulcer rate in young participants is surprising, but may be explained by a high proportion of NSAID-naïve, and thus ulcer-prone volunteers. On the basis of our results, it is reasonable to assume not only that elderly people develop more ulcers on NSAID but also that they are more prone to bleed or perforate. The explanation for this is outside the scope of the current study, but most likely includes factors such as age-related thinning of the gastric submucosal tissues, atherosclerosis and less-brisk repair mechanisms. Fries JF. NSAID gastropathy: the second most deadly rheumatic disease? Epidemiology and risk appraisal. J Rheumatol Suppl1991;28:6–10. Hernandez-Diaz S, Rodriguez LA. Incidence of serious upper gastrointestinal bleeding/perforation in the general population: review of epidemiologic studies. J Clin Epidemiol2002;55:157–63. Laine L, Bombardier C, Hawkey CJ, Davis B, Shapiro D, Brett C. Stratifying the risk of NSAID-related upper gastrointestinal clinical events: results of a double-blind outcomes study in patients with rheumatoid arthritis. Gastroenterology2002;123:1006–12. MacDonald TM, Morant SV, Robinson GC, Shield MJ, McGilchrist MM, Murray FE, et al. Association of upper gastrointestinal toxicity of non-steroidal anti-inflammatory drugs with continued exposure: cohort study. BMJ1997;315:1333–7. Simon LS, Hatoum HT, Bittman RM, Archambault WT, Polisson RP. Risk factors for serious nonsteroidal-induced gastrointestinal complications: regression analysis of the MUCOSA trial. Fam Med1996;28:204–10. Competing interests: MB has participated in advisory boards for Pharmacia and Pfizer, the manufacturer of celecoxib. MT, HI and JF were employees of Pharmacia at the time of design and execution of the study, but have left the company since its merger with Pfizer. JG has been reimbursed by Pharmacia and Pfizer for attending conferences, speaking/participating at conferences, and has received monies to conduct research and has also received compensation for acting as a consultant. All authors contributed to design, analysis, interpretation and report. Data extraction from the original trial datasets and analyses were performed under the supervision of H van Ingen at Pharmacia Corporation.